The PickUp’s ridership and cost per passenger have both grown about 60% as West Hollywood has expanded the service. That is according to a new report by WeHo by the Numbers, based on city data. 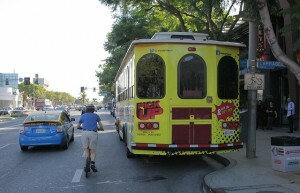 The PickUp is an entertainment shuttle (“trolley”) that runs along Santa Monica Boulevard. It started in 2013 with service on Friday and Saturday nights. The city later extended the route beyond Fairfax to La Brea and added service on Sundays and nightlife holidays. According to a survey, 93% of riders are either satisfied or very satisfied with the service, which is free. The PickUp provided over 90,000 rides (passenger trips) in fiscal year 2018. The fiscal year ran from July 2017 through June 2018. The FY2018 total was roughly 60% higher than the 57,000 rides provided in FY2014. 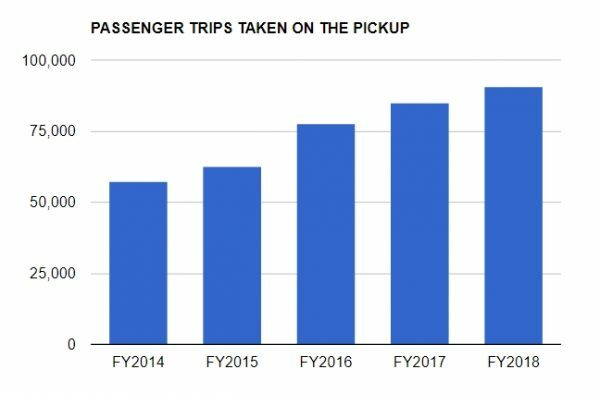 The report suggests that the PickUp’s ridership growth has been driven primarily by service expansions, rather than more intensive use of the original Friday/Saturday service. The suggestion is based on two observations. The first is that ridership per service day actually declined slightly despite the increase in total ridership. It went from 608 in FY 2014 to 574 in FY 2018, a 6% decline. The second observation is that ridership for the original Friday/Saturday service also fell an estimated 6% between FY 2014 and FY 2018. The estimated decline was 12% if one focuses only on the years with the longer route. The report also looks at costs. The city spent close to $600,000 on the PickUp in FY 2018, or about $50,000 a month. That includes operations (over 90%) and marketing, but not the time of city staff members. The cost per passenger trip was about $6.50 in FY2018. It increased more than 60% from FY 2014 to FY 2018. Some or all of the increase may be explained by the service expansions. The PickUp’s cost per passenger trip is well below the number for the city’s daytime CityLine service. CityLine’s cost was $12 per passenger trip in 2016. It is unclear how the PickUp’s cost per passenger trip compares to similar services in other cities. A city consultant concluded that the PickUp’s number ($4 at the time) “compares favorably with other small public transit operators…throughout California.” However, the City of Palm Springs recently estimated the cost per passenger trip for 10 trolley services and only one was above $5. Palm Springs came in around $4.50. West Hollywood was not included in that Palm Springs comparison. The WeHo by the Numbers report did not investigate the numbers further. To find out more, see the full report, How has West Hollywood’s PickUp performed? I realize there’s a lot I don’t know about running a public transit service, but I have to wonder how this service could possibly cost $50,000/month, with 90% of that designated as operations. Running typically 3 days per week, that’s roughly $4,000 per day for operations. I’d really like to see the accounting on that one. Nice article. 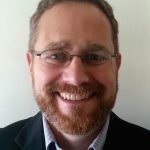 Metro sent West Hollywood over $2.1 million in its latest funding allocation, see http://metro.legistar1.com/metro/attachments/94be80bf-6ccb-44ae-a0af-ed9438ae1a61.pdf The city can afford to run the Pickup transit service. Its way better that more cars circling looking for parking and more ubers pulling to a dead stop in lanes of traffic. I hope it keeps going and i wish they started the trolley at 7pm on Friday and Saturday so we could actually take it to restaurants up and down the blvd. and people can use Metro buses. Why should a city that is flush with cash close these services, which benefit residents, senior citizens, and tourists, who spend money, and increase tax revenue to the city? It is probably not possible to calculate, but my guess is that tourist spending covers the cost of these services. And even if not, the residents deserve to have services given back to them.